We hit $5000! You are amazing…thanks for helping us reach our first milestone so quickly! 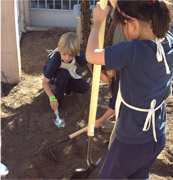 This week we start launching our Fall 2013 Healthy Growing program, starting with a Dig Day on Tuesday at Baywood Elementary, with help from Baywood’s School Champion, Webcor. We’re also getting the Growers Gala ready for you and the other passionate foodies out there. Make sure to get your tickets soon, as they’re going quick! And remember that ALL revenue from these tickets go directly towards our 2013 Fall Schools, so if you’re friends like local, fresh food; beer, wine, sangria; and chocolate tasting…then they’ll probably be upset if you don’t tell them about this awesome food fest.